KINAFORUM: Torbjørn Færøvik: Hvordan hedre Liu Xiaobo? Les det han skrev! Torbjørn Færøvik: Hvordan hedre Liu Xiaobo? Les det han skrev! 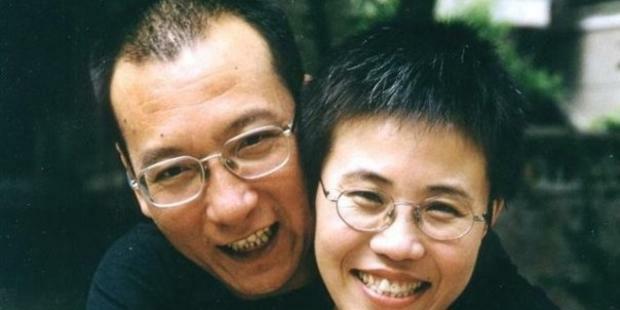 Liu Xiaobo er død, men ordene han festet til papiret, lever. Fredsprisvinneren hadde en stor litterær produksjon som strakte seg over en periode på rundt 30 år. Noen av skriftstykkene er utgitt i bokform på engelsk og andre språk. Den kanskje beste måten å hedre ham på, er å lese noe av det han skrev. To av bøkene nevner jeg her. 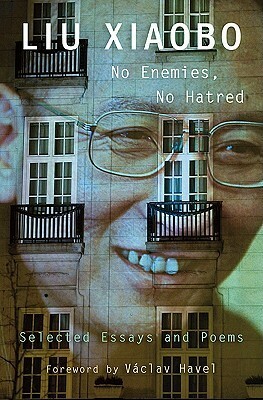 No Enemies, No Hatred. Selected Essays and Poems utkom i 2012. I flere essays behandler han ulike temaer, som Internetts betydning i Kina, bøndenes kår, demokratibevegelsens utvikling, nasjonalismens rolle, barnearbeid, politisk humor, idrettsbevegelsens olympiske jag og Kinas rolle i verden. Liu var en allsidig tenker som interesserte seg for alt. Flere av diktene i boken, er tilegnet hans kone, Liu Xia. 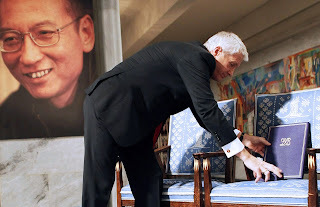 En annen lett tilgjengelig bok er Liu Xiaobo's Empty Chair. Chronicling the Reform Movement Beijing Fears Most, skrevet og redigert av den amerikanske sinologen Perry Link. I tillegg til forfatterens egne bidrag inneholder den flere tekster av Liu Xiaobo og ikke minst det viktige Charter 08 - det kinesiske frihetsbrevet som Liu og flere andre sto bak. Liu Xiaobo ble tidlig oppslukt av bøker. Selv under Kulturrevolusjonen på 1960-tallet - da han og hans familie ble forvist til en folkekommune i Indre Mongolia - søkte han tilflukt i det skrevne ord. I ledige stunder satt han bøyd over både lovlige og forbudte bøker. Sitt litterære gjennombrudd fikk han på 1980-tallet. I intellektuelle kretser ble han betraktet som en kommende stjerne, men frittalende som han var, slet han med å finne villige forleggere. Etter hvert begynte han å sende manusene sine til Hongkong og USA. På denne måten ble han kjent også utenfor sitt eget land. I 1988 fikk han sjansen til å besøke Norge som gjesteforeleser ved Orientalsk institutt på Blindern. Møtet med instituttets sinologer imponerte ham ikke. Til sin store skuffelse oppdaget han at de ikke kunne snakke kinesisk særlig godt, selv om de kunne lese det tålelig bra. Etter noen måneder på norsk jord reiste han til USA, hvor han fant et mer inspirerende intellektuelt miljø. Erfaringene han høstet på sine korte utenlandsbesøk, ga ham en mulighet til å sammenlikne Kina med vestlige land - et tema som går igjen i flere av tekstene hans. Med et søk i Google eller internasjonale nettbokhandlere får du raskt en oversikt over hva som måtte være tilgjengelig. I mellomtiden byr jeg på noen sentrale sitater fra Liu (på engelsk). De fleste er hentet fra Lius essays i No Enemies. No Hatred. Av forståelige grunner har vi ingen tekster eller utsagn fra fredsprisvinneren etter at han ble fengslet i 2009. God lesning - og husk: Det er fullt mulig å elske Kina - og å hate det. Men å stille seg likegyldig til det, er umulig. Over the past two decades, from 1989 to 2009, I have consistently held that China’s political reform should be gradual, peaceful, orderly, and under control. I have always opposed the notion of sudden radical leaps, and have opposed violent revolution even more stoutly (…) my keywords for China’s political reform are gradual, peaceful, orderly, and controllable, and I favor a symbiosis of bottom-up and top-down efforts. Poverty in China today is not just a matter of inadequate resources or supply, but more a poverty of the political system and a poverty of rights. Treating speech as crime not only runs counter to the modern trends of world history; but, more deeply, abuses humanism and human rights in a fundamental moral sense. This is true regardless of whether we are speaking of ancient times or modern, of China or the world. In the annals of Chinese imperial history from the third century BC to the early twentieth CE, whereever punishment of scholars for their words has been noted, those events have come to be viewed as black marks on the records ot the regimes that imposed them and as embarrassments to the Chinese nation. Problems of the pen can be solved only by the pen; to answer pens with guns only leads to human rights disasters. Only when the practice of treating speech as crime is fundamentally uprooted from our system can citizens across our great land finally be assured that the freedom of speech guaranteed by our constitution will be a living reality for them. This guarantee will require constitutional change. China’s rise has become the steady refrain in the Western world (…) Comments from the West like ”a formidable China is on the rise” and ”the sleeping giant has re-awoken” ring constantly in the ears. This Western talk about China’s rise (…) does much to stimulate Chinese nationalism. Chinese people really begin to think of themselves as ”a huge soaring dragon” or ”a sleeping giant re-awoken”. Behind the spending sprees of Chinese tourists all around the world lies the extreme polarization of wealth that has resulted from the plunder of ”collective” and ”state” resources by a corrupt power elite. The international community ignores at its peril the fact that the contest today between the Chinese Communist dictatorship and the free world is very different from the earlier one between the free world and the Soviet Communists. The Chinese Communists have abandoned their ideology and are not pursuing global military confrontation in the way the Soviets did. They are concentrating on economics, seeking to make themselves part of globalization, and are courting friends internationally precicely by discarding their erstwhile ideology. At home, they defend their dictatorial system any way they can, explicitly combating the ”peaceful evolution” about which Western leaders have expressed hope and sometimes confidence. They use their bulging purse to buy ”friendship” in dollar diplomacy throughout the world. Already they have become a blood-transfusion machine for a host of other dictatorships. Meanwhile they use the carrot and sticks of trade deals, and the lure of the huge market they control, to manipulate and divide the world’s major democracies. The income of the Communist regime has skyrocketed, far exceeding the growth rate of the country as a whole and the average citizen. High officials have begun to throw their weight around and to scatter money across the globe. Their private hoards could make those mighty capitalists of the Industrial Revolution look shabby (…) The ”miracle” came at the price of disregard for personal freedoms and the public good. The main beneficiaries of the miracle have been the power elite; the benefits for ordinary people are more like the leftovers at the banquet table. As a member of the UN Human Rights Council, and as a permanent member of the UN Security Council, China should feel a duty not only to honor its own commitments to UN human rights covenants but, beyond that, to be a model for others in showing how rights should be guaranteed. This is the way, indeed the only way, in which the Chinese government can assure the human rights of its own citizens as well as make a contribution, as a great nation should, to the project of advancing human rights globally. The freedoms that the Tibetans lack are also missing for the Han people. The exiled Dalai Lama cannot go home, just as Han dissidents who were exiled after the 1989 Tiananmen massacre cannot go home. The tactics that the regime uses against the Dalai Lama are the same that it uses against Falungong and other popular religions among the Han (...) In short, to cast the current Tibetan crisis as a conflict between Hans an Tibetans is misleading and superficial. The real and deeper issue is a conflict between dictatorship and freedom. The resolution of the Tibet question depends fundamentally on the question on the form of government that China will have in the future. Democratization for all of China is the necessary condition for any solution, whatever its form, to the Tibet issue (…) Only when the democratization of Chinese politics truly begins can negotiations between Beijing and the Dalai Lama also truly begin. The Dalai Lama, a sagcious man, has a vision for an autonomous, democratic Tibet in which church and state are separate. The vision is grounded in a system that has worked well for many years in the Tibetan government in exile in Dharamsala, India. He has an excellent track record for implementing experiments in democracy similar to those of Chiang Ching-kuo in Taiwan in the 1980s. Such experiments could serve as models for the political transformation of China as a whole. The dawn of true political reform in China can arrive as soon as Chinese authorities sit down at the negotiating table with the Dalai Lama. China is on the road to the worst kind of crony capitalism. The power elite brazenly divvies up Party assets, and the intellectuals shamelessly whitewash what is going on (…) This is what lies behind the economic miracle: the ”miracle” of systemic corruption, the ”miracle” of an unjust society, the ”miracle” of moral decline, and the ”miracle” of a squandered future. The damage to the economy, to human rights, to the entire society is incalculable. Will we ever be able to recover? If so, that will ble the miracle. I am aware of my own limits, and I know that my public statements cannot have been perfect. Especially in my commentaries on current events, I have sometimes fallen into slipshod argument, excessive emotion, factual error, and sweeping conclusions. But none of these errors has anything to do with crime, and cannot be valid evidence in a criminal trial. This is because the right to free speech includes not just the right to say correct things but also the right so say incorrect things. I have no enemies, and no hatred. None of the police who have watched, arrested, or interrogated me, none of the prosecutors who have indicted me, and none of the judges who will judge me are my enemies. There is no way I can accept your surveillance, arrests, indictments, or verdicts, but I respect your professions and your persons (...) Hatred only eats away at a person's intelligence and conscience, and an enemy mentality can poison the spirit of an entire people (as the experience of our country during the Mao era clearly shows). For these reasons I hope that I can rise above my personal fate and contribute to the progress of our country and to changes in our society. I hope that I can answer the regime's enmity with utmost benevolence, and can use love to dissipate hate. Armed with your love, dear one, I can face the sentence that I am about to receive with peace in my heart, with no regrets for the choices that I have made, and filled with optimism for tomorrow. I look forward to the day when our country will be a land of free expression: a country where the words of each citizen will get equal respect; a country where different values, ideas, beliefs, and political views can compete with one another even if they peacefully coexist; a country where expression of both majority and minority views will be secure, and, in particular, where political views that differ from those of the people in power will be fully respected and protected; a country where all political views will be spread out beneath the sun for citizens to choose among, and every citizen wil be able to express views without the slightest fears; a country where it will be impossible to suffer persecution for expressing a political view. I hope that I will be the last victim in China’s long record of treating words as crimes. Free expression is the base of human rights, the root of human nature, and the mother of truth. To kill free speech is to insult human rights, to stiffle human nature, and to suppress truth. I feel it is my duty as a Chinese citizen to try to realize in practice the right of free expression that is written in our country’s constitution. There has been nothing remotely criminal in anything that I have done, yet I will not complain, even in the face of the charges against me. I thank you all.